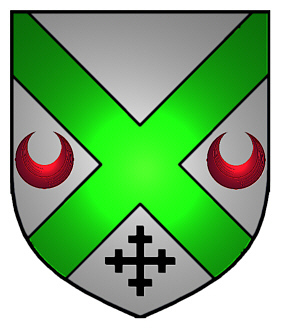 Coat of Arms: A silver shield with a green saltire between two red crescents on either side and a black cross crosslet in base. Some of the first settlers of this name or some of its variants were: Anne Clarkson who settled in Virginia in 1638 with Jane, her sister; Richard Clarkson arrived in Jamaica in 1685; Charles Clarkson arrived in Fort Cumberland Nova Scotia in 1774. 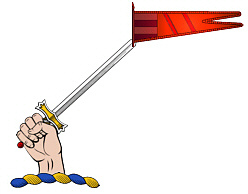 A hand holding a sword on which there is a red pennant. 1. To determine if the Claxton, Clarkson, Clarkston, Clayton and Clark lines are connected. 2. To connect the various lines with their ancestors and to differentiate between the lines. 3. To determine if Jeremiah Claxton is related to James Claxton progenitor of the Wright Co., Missouri Claxtons and one line of Tennessee Claxtons. 4. To determine if Thomas Clarkson of Lee Co Virginia and James Clarkson/Claxton of Claiborne Co. Tennessee were in fact brothers, and if so, if George Middleton Clarkson, executed in the State of Franklin in about 1785 was their father (if possible). 5. To determine if the Claxton families of Oklahoma, Missouri, Tennessee, and Georgia are related. 6. To determine if the Tennessee, Virginia and Pennsylvania lines are related. 7. To identify our immigrant ancestor(s) if possible. 8. To determine our Clarkson/Claxton/Clarkston native homeland. 9. To break down those brick walls. The CLARKSON name is an important part of the history of the ancient Anglo-Saxon tribes of Britain. CLARKSON is derived from the popular family name Clark, and means the son of Clark. 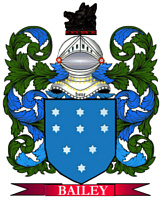 The surname also has an occupational origin and was likely derived from the trade or profession of the original bearer. In this case the surname denotes that the bearer was a clerical worker or a clergyman who was employed in religious institutions to write books from old documents. The bearers of this surname were handed high status in the community because of their ability to read and write. One must remember that during the Middle Ages most of the population was quite illiterate by today's standards. Spelling variations include: Clarkson, Clarksone, Clerkson and others.